The percentages are in our favor…making PowerHouse IHF Chargers an unsurpassed world leader in energy efficient forklift battery chargers across the entire charge cycle. 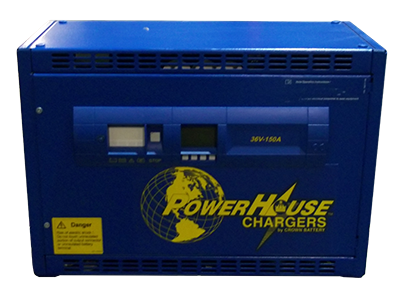 Ideal for charging both flooded and maintenance free batteries, the PowerHouse IHF Charger combines microprocessor control with High Frequency IGBT Technology into the ultimate low maintenance package. They are UL listed, and they provide ripple-free current which improves the energy transfer. Chargers are available in 24- to 80-Volts DC and are easy to use. A brilliant traffic light display tells you the exact status of the charge. Multiple pre-programmed charging curves are included with a USB port using Windows™ based software for easy operation, maintenance and statistics. Reduced volume and weight by a factor of 5 compared to ferro chargers. Supplied with an optional BATCOM™ wireless controller that can provide information to the corresponding charger such as over-temperature, low electrolyte and battery state-of-charge. Bright blue LED indicator on front panel for low electrolyte level alarm. Large “traffic lighting” change status light. Optional remote control switch off. Optional automatic battery watering. Designed for networking and internet-based remote site management. UL, cUL and CSA approved. Highest efficiency available, lowest operating cost charger available on the market today. © 2019 Mark C. Pope Associates, Inc. – Forklift Batteries & Chargers All rights reserved.